My Cottage Charm: Beneath My Heart..Party Time! 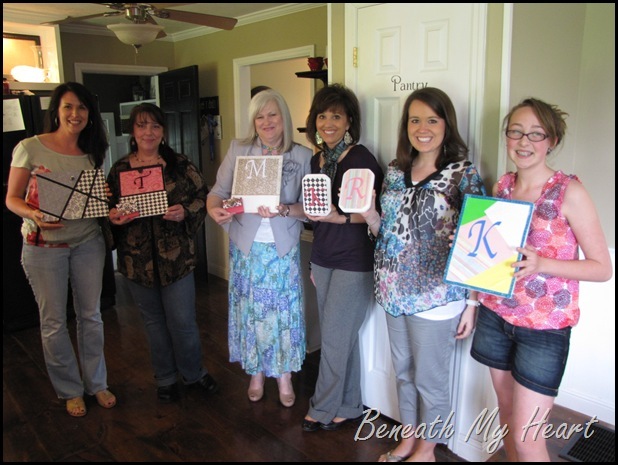 I just wanted to share with you all the fun I had at Traci’s house from Beneath My Heart! She had an Elmer’s Craft and Tell Party and it was SO fun! 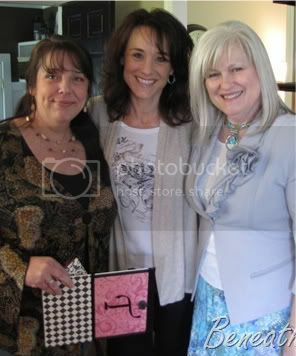 Here’s a pic of Me, Traci (Beneath My Heart), and Gail (another KY blogger…Gleanings From Gail)…what precious ladies! We met at her house on a Sunday afternoon for the party, there was a great group of ladies there…. We all had a wonderful time and pigged out on these amazing cupcakes from The Yellow House Cakery! 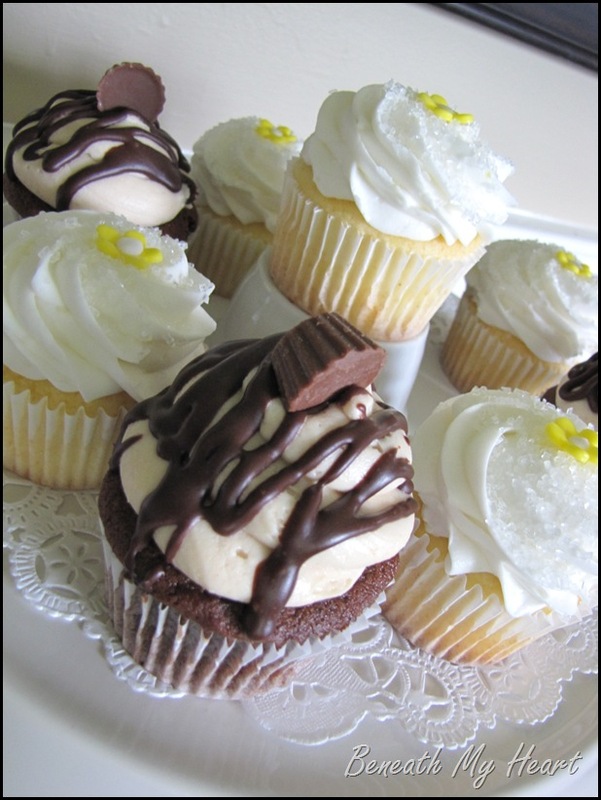 I had a lemon one, but the other looked yummy too…it was a peanut butter cup cupcake. Traci also had other goodies on hand…she was a wonderful hostess! This picture lets you see how very short I am (second one from the left)……her nieces are even taller than me…sigh. Traci blogged about the whole party HERE and has some hilarious pictures of all of us with thought bubbles…you HAVE to go read it..she is SO funny! What Traci didn’t blog about (because she’s so nice!) is that my car broke down in her drive way…oh gee! I’ve had that thing for nearly 4 years and NEVER had a problem with it until now! LOL Apparently my key and my computer weren’t talking and I had to have a new computer module installed. Traci was so gracious and took care of me till my my hubby and the tow truck arrived. :0) I was really ok with my car breaking down after Traci and I got to spend some real quality time talking. I feel so very blessed to know her in real life! I have read her blog for a long time, but getting to call her my real life friend is such a joy! If you don’t know Traci you need to hop over to her blog and see how wonderfully talented and sweet she really is! How lucky you are to be close to some real boggie buddies!! I hope to meet some for real sometime too!! Looks like a great time at the party!! Hope your car feels better soon!! Take Care! What a fun day you all had, Missy! Great photos! You are so pretty...and tiny! I bet y'all had the best time. How lucky you are to be living so close to Traci. I love her blog and she is the sweetest lady. I have been away from blogging for a little while and have missed it so much. I have a lot of catching up to do. I'll have to go back and read some of your past posts to see what you've been up to. Hope you had a wonderful Mother's Day. I'm so glad you had the opportunity to meet! It looks like a grand time was had creating and getting to know each other. I enjoyed Traci's post with the thought bubbles - so funny!